CHICAGO—As Eric Ruderman, MD, professor of medicine in rheumatology at Northwestern University Feinberg School of Medicine in Chicago, began his talk on psoriatic arthritis treatment at the ACR State-of-the-Art Clinical Symposium in April, he marveled a bit at how much there was to cover. 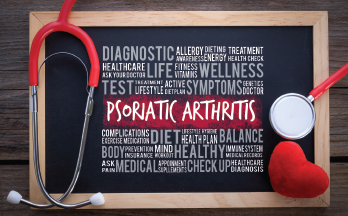 Drugs gaining prominence in the treatment of rheumatoid arthritis and dermatological diseases have begun to carry over into psoriatic arthritis (PsA) research, where many have proved effective. “Just a year ago, this talk would have had a lot less involved,” he said. Biologics are being assessed in PsA at a rapid rate—some with persuasive data, some in small but tantalizing samples, Dr. Ruderman said. As new therapies undergo testing, he said, it’s important to consider how they affect the array of disease manifestations. Dr. Ruderman spoke about several therapies, including apremilast, tofacitinib, abatacept, ustekinumab, ixekizumab, secukinumab, bimekizumab, risankizumab and guselkumab. This therapy, which binds CD80 and CD86, produced a “modest” ACR20 response rate of 40%, but it was still superior to placebo and is another option for patients who fail earlier treatments. The response on skin was not impressive, Dr. Ruderman said. Can the biologic Taltz be combined with Xelganz? Please check with your rheumatologist and pharmacist.